Claim the Iron Throne and the lands of Westeros! King Robert Baratheon is dead, and the kingdoms of Westeros brace for impending war. House Lannister, whose daughter Cersei was Robert's queen, claims the throne for her young son Joffrey. From his seat on the isle Dragonstone, Robert's younger brother Stannis rightfully demands the throne for himself. On the Iron Isles, House Greyjoy is about to embark on a second rebellion, but this time with a grander goal. In the north, House Stark gathers its strength to defend what is right. In the south wealthy House Tyrell harbours an old ambition to sit on the Iron Throne but must be ever wary of the ancient House Martell and its legacy of vengeance. All the while, in the far north beyond the Wall, the wilding threat steadily grows in strength. As armies gather and ravens fly, a clash of kings is inevitable. Based on the best-selling novel series A Song Of Ice and Fire by George R.R. 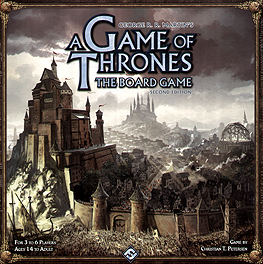 Martin, A Game of Thrones: The Board Game allows players to take control of the great Houses of Westeros and embark on an epic struggle to claim control of the Iron Throne. Immerse yourself in a game of clever planning, careful allocation of power, and delicate diplomacy, and the exciting flavour of A Song of Ice and Fire. This updated 2nd Edition of the best-selling board game brings a host of enhancements to your A Game of Thrones experience. It incorporates elements from the previous expansions, including ports, garrisons, wildling cards, and siege engines. In addition, it introduces welcome new innovations; convenient players screens hide your careful planning from prying eyes, while the new Tides of Battle cards convey the risks of war. There\'s no doubt that you get your money\'s worth both in quality and quantity. Much has been incorporated from the expansions to produce an all-embracing conflict for upto 6 players. Many of the physical changes seem clearly designed to enhance the atmosphere of the game and catch the mood of both the books and the T.V. series. The board is much darker and brooding, as are the colours both of the control markers and the units. That said there were times when mistakes were made both on the map and on the three displays that determine priority in ties between players. In particular, several times cavalry were mistaken for infantry and some of our players initially found themselves with siege machines that were ships stood on end! Ultimately, these were minor issues and the flow of the game was smooth and engrossing. A second play with again a full complement of six players was even more fun when everybody brought an element of RPG to their roles as leaders of the great houses. For price, quality and game play, definitely one to add to your collection. Not a bad Empire building game, though it does run rather long. If you're into the books then you're bound to love this and the expansions. There's quite a lot going on. Ships are very powerful and you need to think hard about where to place them. Attacks from your enemies can come very quickly and from a long way away if they have powerful fleets. Having played this game twice I can highly recomemed it. I think the sign of a good game is that you do not notice the time passing and this is one of those games. It has the feel of a good old fashion war game but with a modern set of rules. There is only one problem with the game, if you do not get a muster early on in the game this can make the game one of positioning and not a lot else.